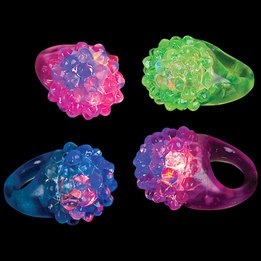 Let yourself be taken away by the charm of our flashing LED bumpy rings, they can be worn or used as a decoration piece. This product is great for special occasions, such as bachelorette parties, dances, weddings, or other themed parties. These flashing LED bumpy rings are made of transparent silicon with assorted LED lights in each ring, and are activated once you push on the button. This product is sold in boxes of 24 units and is an excellent price for the quality. This product is not recommended for children under 5 years of age. These LED rings have an approx 24 hour consecutive usage. They weight less than 1 lb, and measure approx 1.5 inches long x 1 inch wide. This light-up product is practical for many different party themes.